^ Burch, M., & Aurora, P. (2004). Current status of paediatric heart, lung, and heart-lung transplantation. Archives of disease in childhood, 89(4), 386-389. ^ a b c d e 福嶌教偉. 第4回リフレッシュセミナー報告 心臓移植. 日本放射線技術学会近畿部会雑誌 第10巻1号,65-70. ^ 小柳仁. 心臓移植と心肺移植. クリニシアン No.337, Vol.32. 45-53. ^ Hatate T. 「脳死臨調最終答申と脳死・臓器移植の展望」. 札幌法学 3(2), 99-130, 1992-03-31. ^ 日本医師会. 国民皆保険の崩壊につながりかねない最近の諸問題について －混合診療の全面解禁と医療ツーリズム－. 社会保障審議会 医療部会. ^ Ono M. 脳死臓器提供におけるメディカルコンサルタントの現状と展望. 今日の移植 Vol.26 No.5 September 2013. 415-23. ^ Nisco SJ, Reitz BA. Developments in cardiac transplantation. Curr Opin Cardiol. 1994 Mar;9(2):237-46. ^ Aziz TM, Burgess MI, El-Gamel A, Campbell CS, Rahman AN, Deiraniya AK, Yonan NA. Orthotopic cardiac transplantation technique: a survey of current practice. Ann Thorac Surg. 1999 Oct;68(4):1242-6. ^ Kitamura S, Nakatani T, Bando K, Sasako Y, Kobayashi J, Yagihara T. Modification of bicaval anastomosis technique for orthotopic heart transplantation. Ann Thorac Surg. 2001 Oct;72(4):1405-6. ^ 1999 Annual report of the US Scientific Registry of Transplant Recipients and the Organ Procurement and Transplantation Network: transplant data 1989-1998. Rockville, MD: United Network for Organ Sharing, 2000. ^ Addonizio LJ. Current status of cardiac transplantation in children. Curr Opin Pediatr. 1996 Oct;8(5):520-6. ^ a b Stewart S, Winters GL, Fishbein MC, Tazelaar HD, Kobashigawa J, Abrams J, Andersen CB, Angelini A, Berry GJ, Burke MM, Demetris AJ, Hammond E, Itescu S, Marboe CC, McManus B, Reed EF, Reinsmoen NL, Rodriguez ER, Rose AG, Rose M, Suciu-Focia N, Zeevi A, Billingham ME. Revision of the 1990 working formulation for the standardization of nomenclature in the diagnosis of heart rejection. 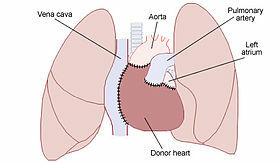 J Heart Lung Transplant. 2005 Nov;24(11):1710-20. Epub 2005 Jun 20. ^ Riley ET. Obstetric management of patients with transplants. Int Anesthesiol Clin. 1995 Spring;33(2):125-40. ^ 許俊鋭. 第49回日本人工臓器学会大会 教育講演 「臓器移植法改正後の心臓移植・補助人工心臓の現況と将来展望」. 人工臓器41巻1号. 2012年. 21-23.